Newly released 1 Ounce Perth Mint Australian Dragon Gold Coin Bar. Each coin contains 99.99 fine investment grade gold bullion. 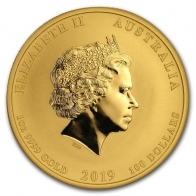 These special edition Australian 1 Ounce gold coins have been released in limited mintage of 25,000 coins. The front of each coin features an image of Queen Elizabeth II. At the top is the coin's weight, purity and metal. Below the image is the coin's face value and year of minting. 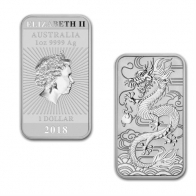 Each 1 Oz gold Dragon coin bar has a face value of $100 Australian Dollars. The reverse side of the coin features an image of a dragon. 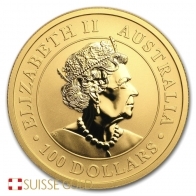 These are sovereign coins, issued with backing by the Australian government, and they have legal tender value. Unlike most legal tender coins, these have been minted in the shape of an ingot or bar. The Perth MInt is famous for releasing a number of highly popular gold, silver and platinum bars and coins. 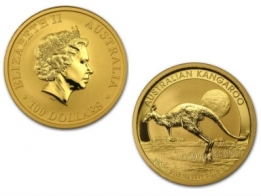 These include the gold Kangaroo coin, the silver Kookaburra and silver Koala coins, and the platinum Platypus. The Perth Mint also release a series of gold and silver bars for investors in precious metals. If you wish to sell any Perth Mint gold or silver bars or coins, please contact us directly. The price includes free Swiss secure vault storage for up to one year.